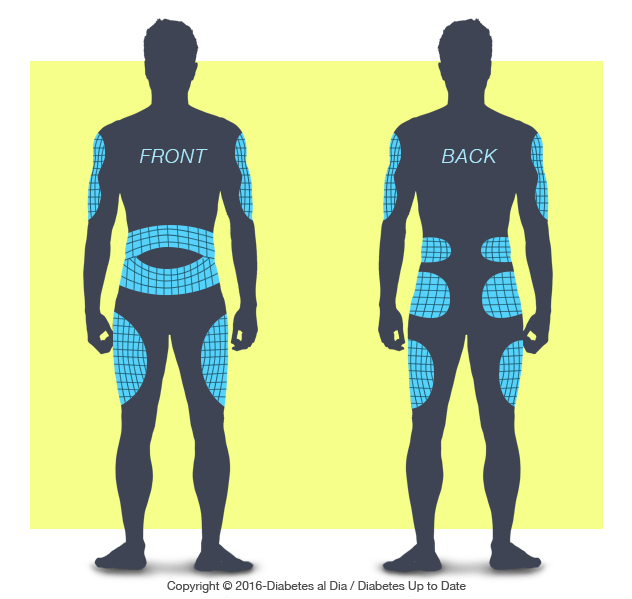 People with Diabetes that require insulin, need to know the places on their bodies where they should inject insulin, as well as, how to rotate the “injection sites”. You might need help from a family member to inject you. All of the body’s injection sites such as: arms, abdomen, legs and buttocks are “injection areas”. Insulin enters the bloodstream faster in some areas than others. It penetrates faster in the abdomen (stomach), slower in the arms, and even slower in the legs and buttocks. Due to these differences in insulin absorption time, your blood sugar level may vary when different areas are used. Your doctor is the only one who can tell you where and how to choose your injection sites; it’s very important to remember that you can only use this information as a guide to what your doctor recommends. 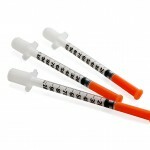 If you only need to inject insulin once a day, use all of the injection sites in that area before moving to another one. This will help keep your blood glucose levels more uniform for longer periods. Start at one extreme of the area, for example the abdomen, and use all of those area’s injection sites in order, numbering each injection site continuously for more convenience. Once you’ve used all the “injection sites” of that area, you can start again in that same area, or move to another one. If you inject yourself more than once a day, use a different area for each injection. For example, you can inject into the arms in the morning, at noon in the abdomen, and legs at night. In some cases, you can choose the injection area based on the need, depending on how quickly you need the insulin to penetrate into your bloodstream. For example, if you need to eat as quickly as possible after your injection, you will want to inject yourself in the abdomen (stomach).